Comments Off on Is your website talking behind your back? 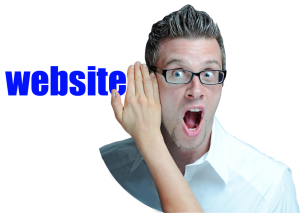 Is your website talking behind your back? Not really. Ok, say maybe you don’t hear the commentary through your computer’s speakers, but the message may be coming through loud and clear to visitors to your site. What is your site saying? It depends. Hopefully, it is saying exactly what you would say if someone asked you why they should do business with your company. Hopefully it inspires them to transition from “visitor” to “customer”. There is nothing new or current going on at this company. The 1990’s called; they want their website back. How do I know if MY website is talking behind my back? Look at competitors’ sites and see how you stack up. Ask yourself if you are proud of your site and eager to send potential clients there. Have us provide a free review of your website. We’ll give you honest feedback and suggestions for improvement. How much does a new website cost? How long is a piece of rope? It really depends on the situation. Are there companies that have spent many thousands of dollars on their website? Yes there are. And there are companies that spent several hundred and my bet is it that you could tell them apart in 3 seconds or less. We’ve built some websites that exceeded $10K, but the vast majority of the sites we’ve built cost half of that or less. To see a few samples of sites we’ve created, CLICK HERE. If you’d like to schedule a no cost-no obligation review of your current website, call us at 636.940.9146 or drop us a line HERE. Let us help you get your website back on YOUR side!